Anyone driving up Highway 50 to Tahoe has seen it on the side of the road. Big banners advertise lobster dinners. Surprisingly, many people will admit to never having been there. This came up at a Meetup months ago and so I agreed to put it on our Meetup calendar. Over the 20 years that I've been in Sacramento I have been to Rudy's a handful of times. Sometime recently they did a remodel and the look is greatly improved, although not all that consistent. One room looks like a captain's dining room with wood paneling and pictures of boating. Another room is more typical restaurant look with contemporary, light-hearted paintings done on aluminum. This is where our small group ended up. 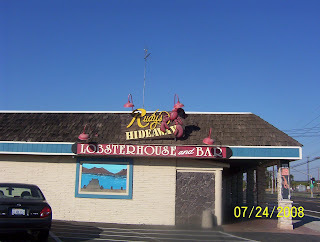 Lobster and seafood is, of course, the focus of Rudy's. There are choices of frozen tails or you can have a lobster freshly killed. Personally, I can tell the difference between live and frozen and therefore will only order live lobster. But at the same time I'm a tightwad and the live lobsters start at $32 at Rudy's. I can walk to my Asian market and get one to kill in the privacy of my own home for half the price. But this wasn't about me tonite and the others mostly did order tails and some ordered salmon. The dinners come with a choice of chowder or salad. I had a cup of the clam chowder and found it disappointing. There was hardly any clams at all. It was super thick, which means lots of flour (carbs!). The flavor was nice, but you want clams or other seafood in chowder. There was a pasta course next. It was a small plate of ziti with a meat sauce on top. Very boring and unappetizing. Some people didn't even bother to eat it. My dinnermates were happy with their entrees. Their sides included a choice of rice or potatoes. The mashed potatoes were freshly made with red potatoes and garlic. I questioned how the salmon was cooked for those that ordered it and they seemed very happy with their meals. Since I was budgeting I had just had chowder and a grilled artichoke. Nothing special there, the aioli was boring. 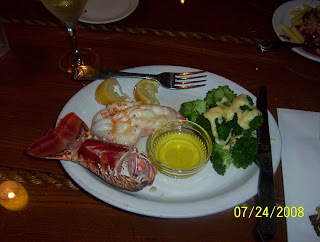 Last year I had ordered my live lobster and had to put the bib on. I had the embarrassing experience of cracking my lobster claws and having juices shoot into my eye as well as clear across to the next table of diners. That doesn't happen when you order the tails and they are already split for you. Service was good, just the right amount of attentiveness. All in all, Rudy's is mediocre seafood and pricey. I'll opt for Scott's Seafood instead for dishes that are more inspired, and my local market for that poor guy to go into my boiling pot.